Arunachal Pradesh Minister for Land Management, Environment & Forest, and Doimukh local MLA Nabam Rebia today was given obstruction by Assam Police officers and police personnel and was not allowed to visit Bogoli-Denka of Gumto Circle of his assembly constituency to attend a public programme of inauguration of Chief Minister’s Adarsh Gram Yojana (Model Village) today. Minister Nabam Rebia convoy in which Papum Pare Deputy Commissioner Dr. Joram Beda and several HODs of the district was on its way though Lalook to Denka which was obstructed near Railway line by Lalook OC Ajit Bhuyan for more than half an hour and again it was obstructed near a bridge by Assam Police force and later the police team led by senior police officer of North Lakhimpur district blockade the road on RCC bridge point of Gaburu river before 3 kilometre of Denka and stuck at the same place for more than 40 minutes and later after intervention of Papum Pare DC and North Lakhimpur DC the police personnel give way to the VIP to go to attend the programme where a foundation stone laying ceremony for ‘Chief Ministers Adarsh Gram Yojana’ was to be laid by the Minister, but the foundation stone laying ceremony was cancelled on request of DC North Lakhimpur. Later addressing the public Rebia said that I have been obstructed by the Assam Police on my way to Denka which is unfortunate and uncalled for. This is my assembly constituency and no one can stopped me to reach my people for discussion and interaction and to hear to the problems of the area. Government is for the people and for its welfare and any developmental schemes are for the welfare of the people and all these development will be there even the said land comes in Arunachal or in Assam if the verdict of the Supreme Courts of India come any time. Welfare schemes are taken up for the convenience and benefits of the local living in the area and is not a matter of border disputed and the police officers and police personnel of Assam have taken it in other ways and may be due to communication gap. Rebia said Assam and Arunachal was one, once upon a time and we all are brother and sister and shall continue to remain like as earlier and our tradition and culture are also known to each other and we often celebrate all local festivals with the presence of each other and there is no dispute at all. He further appeal one and all people living across the boundary to maintain peace and tranquillity and cordial relation with communal harmony. While speaking to media Nabam Rebia said that I have never expected that I may be stopped by Assam Police to meet my own people. I was supposed to laid a foundation stone for ‘Chief Ministers Adarsh Gram Yojana’ which was cancelled on the request of the Deputy Commissioner North Lakhimpur. However he have raised his concern on the manner the Assam police have stopped him to attend his own assembly constituency. He said that there is no border dispute and any confrontation. There is no point of confrontation among both state and any thing which would be based on the verdict of the Supreme Court of India. I have always advocated for peace and tranquillity and communal harmony by each other. Development is for people which is basis of the people. 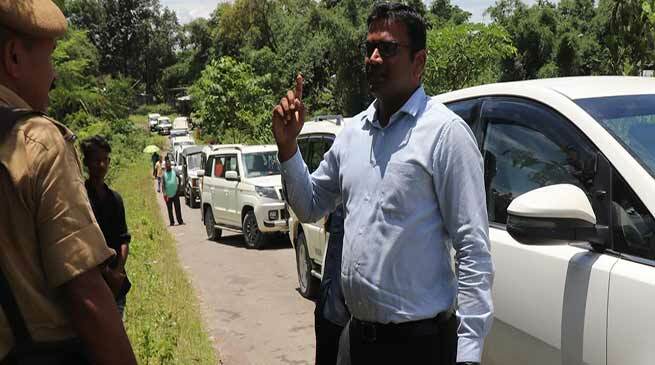 When ask a comment on road blockage by Assam police to Arunachal Minister on Lalook-Denka road DC North Lakhimpur Dr. Jeevan B said that he could not comment anything and will spoke lateron.